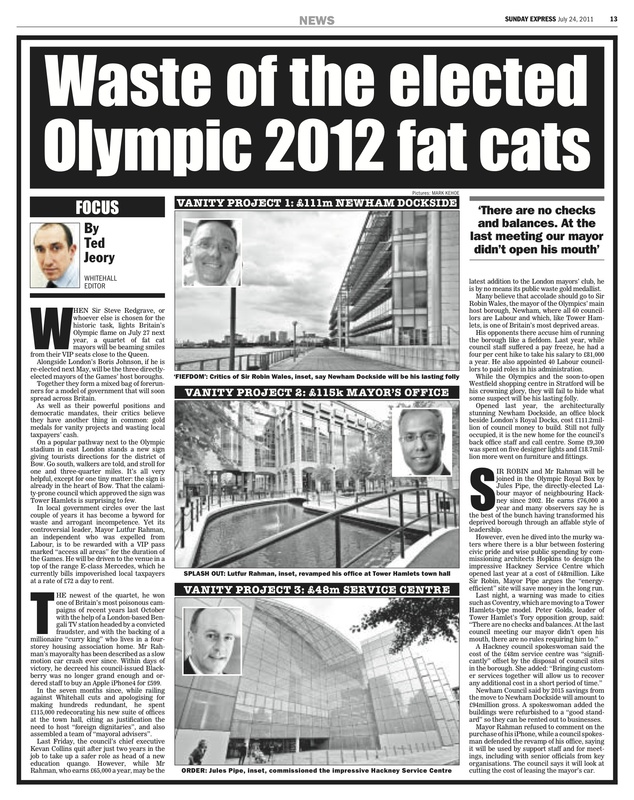 If you’ve ever been to the sumptuous Newham Dockside office complex by the Royal Docks, or passed by the architecturally brilliant Hackney Service Centre in Hillman Street, or marvelled at Lutfur Rahman’s spending on desks and filing cabinets, then you might be interested in this piece I wrote for today’s Sunday Express. WHEN Sir Steve Redgrave, or whoever else is chosen for the historic task, lights Britain’s Olympic flame on July 27 next year, a quartet of fat cat mayors will be beaming smiles from their VIP seats close to the Queen. Alongside London’s Boris Johnson, if he is re-elected next May, will be the three directly-elected mayors of the Games’ host boroughs. Together they form a mixed bag of forerunners for a model of government that will soon spread across Britain. As well as their powerful positions and democratic mandates, their critics believe they have another thing in common: gold medals for vanity projects and wasting local taxpayers’ cash. On a popular pathway next to the Olympic stadium in east London stands a new sign giving tourists directions for the district of Bow. Go south, walkers are told, and stroll for one and three-quarter miles. It’s all very helpful, except for one tiny matter: the sign is already in the heart of Bow. That the calamity-prone council which approved the sign was Tower Hamlets is surprising to few. In local government circles over the last couple of years it has become a byword for waste and arrogant incompetence. Yet its controversial leader, Mayor Lutfur Rahman, an independent who was expelled from Labour, is to be rewarded with a VIP pass marked “access all areas” for the duration of the Games. He will be driven to the venue in a top of the range E-class Mercedes, which he currently bills impoverished local taxpayers at a rate of £72 a day to rent. The newest of the quartet, he won one of Britain’s most poisonous campaigns of recent years last October with the help of a London-based Bengali TV station headed by a convicted fraudster, and with the backing of a millionaire “curry king” who lives in a four-storey housing association home. Mr Rahman’s mayoralty has been described as a slow motion car crash ever since. Within days of victory, he decreed his council-issued Blackberry was no longer grand enough and ordered staff to buy an Apple iPhone4 for £599. In the seven months since, while railing against Whitehall cuts and apologising for making hundreds redundant, he spent £115,000 redecorating his new suite of offices at the town hall, citing as justification the need to host foreign dignitaries, and also assembled a team of “mayoral advisers”. Last Friday, the council’s chief executive Kevan Collins quit after just two years in the job to take up a safer role as head of a new education quango. However, while Mr Rahman, who earns £65,000 a year, may be the latest addition to the London mayors’ club, he is by no means its public waste gold medallist. Many believe that accolade should go to Sir Robin Wales, the mayor of the Olympics’ main host borough, Newham, where all 60 councillors are Labour and which, like Tower Hamlets, is one of Britain’s most deprived areas. His opponents there accuse him of running the borough like a fiefdom. Last year, while council staff suffered a pay freeze, he had a four per cent hike to take his salary to £81,000 a year. He also appointed 40 Labour councillors to paid roles in his administration. While the Olympics and the soon-to-open Westfield shopping centre in Stratford will be his crowning glory, they will fail to hide what some suspect will be his lasting folly. Opened last year, the architecturally stunning Newham Dockside, an office block beside London’s Royal Docks, cost £111.2million of council money to build. Still not fully occupied, it is the new home for the council’s back office staff and call centre. Some £9,300 was spent on five designer lights and £18.7million more went on furniture and fittings. Sir Robin and Mr Rahman will be joined in the Olympic Royal Box by Jules Pipe, the directly-elected Labour mayor of neighbouring Hackney since 2002. He earns £76,000 a year and many observers say he is the best of the bunch having transformed his deprived borough through an affable style of leadership. However, even he dived into the murky waters where there is a blur between fostering civic pride and wise public spending by commissioning architects Hopkins to design the impressive Hackney Service Centre which opened last year at a cost of £48million. Like Sir Robin, Mayor Pipe argues the “energy- efficient” site will save money in the long run. Newham Council said by 2015 savings from the move to Newham Dockside will amount to £94million gross. A spokeswoman added the buildings were refurbished to a “good standard” so they can be rented out to businesses. Mayor Rahman refused to comment on the purchase of his iPhone, while a council spokesman defended the revamp of his office, saying it will be used by support staff and for meetings, including with senior officials from key organisations. The council says it will look at cutting the cost of leasing the mayor’s car.